Want more on Twitter, Facebook and Email Marketing? Grab the whole Book Marketing Basics series for less than a buck! If you’ll grant me just a second here, I’d like to pull out my crystal ball and see if I can call forward your current blog predicament. Ah, yes, I see it here very clearly. You spend hours of time (when you’d rather be writing or hanging with your family) slogging away to write new posts for your blog. Your topics are all over the place because you’re desperate to find something that will appeal to someone. You know you have a few readers, but no one’s ever interested enough to comment. The only posts that get any attention are the ones you write about your author career, and even then they’re only picked up by other authors — not a reader who might be interested in your book. But before you give up blogging all together, take a couple of deep breaths (and if you’re of legal age, a drink) and let me help you. See, this crystal ball is actually a snowglobe from my Christmas collection. My knowledge of your blogging frustrations comes from my own experience because I’ve been there. Starting with my LiveJournal way back in the day, I’ve had a series of blogs over the last decade or so and have run into the same problem with each one. I had no direction. No direction means no readers. No readers means no point in having a blog. But in all reality, a blog can be your best asset for marketing yourself and your books. You just have to know how to do it smarter, better and more efficiently — then it will be the best tool in your kit for building your fanbase. If Toni and I ever form a band (we won’t) the chorus of our first song will be: “Know your audience!” and then like a ten minute wicked guitar solo. Why? Because it’s SUPER IMPORTANT. The same target market and reader profile you created with us before to focus your marketing campaign should be put to use with your blog. I’m not talking about your current audience either. I’m talking about the audience you *want* to have. Your ideal readers, the ones who will enjoy your blog -and- your books. Those are the folks you want subscribing to your RSS feed or your newsletter and those are the folks you want to interact with in the comments to build a relationship. So if you haven’t identified your target market and more specific (more useful) reader profile yet, for Pete’s sake get to it! 2. Brainstorm four blog topic categories. STOP! I saw you just try to crawl up under your desk at the thought of talking about your personal life on your blog. But understand I’m not asking you to blog about every delicate detail of your day — I’m just asking for some insight into who you are as a person. Part of building that relationship with your reader is connecting with them on a personal level. You can absolutely retain your privacy while still sharing some interesting stories from your own personal experiences. You other two categories should be interests you and your target reader both share. Whether it’s crafts, parenting, technology, sci-fi movies or food, if you look closely at your reader profile you should be able to find at least two things you and your reader have in common. 3. Make an editorial calendar. Once you’ve got your four core categories nailed down, it’s time to make an editorial calendar. 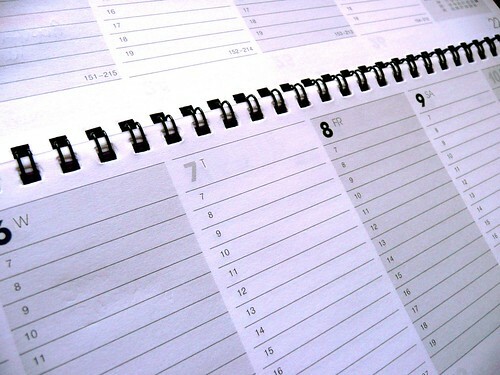 Decide on your posting schedule (shoot for once a week) and start planning out your topics at least four weeks at a time. Rotate through each of your categories so you’ve created a new post for each by the end of every month. Take one extra step and after you’ve planned your topics, go ahead and create a catchy headline your readers won’t be able to ignore. If you use WordPress, you can go ahead and create the post, add your headline and schedule it for your planned publication date so you’ll have a clear goal and deadline. This is the single most useful thing I’ve ever learned about blogging. After you have your topic and headline, you need to outline your post just like you’d outline your novel. It needs a clear beginning, middle (with some sort of problem or tension) and end (with resolution). A common blog outlining strategy I use is to focus on a problem, underlying problem (what’s really at the root of the problem) and then propose a solution to the problem (this comes from years as a Future Problem Solver of America!). Having an outline means not having to sit there, starring at the blinking cursor, trying to pull some great piece of writing out of thin air. Organize your thoughts and I guarantee you, the time you spend blogging will be cut in half. 5. Create an action step. At the end of your post, you need to encourage your readers to react with an action step. This can be as simple as answering a question in your comments. You can also ask them to sign up for your mailing list, check out the landing page for a new book you’re working on, or to send you an email. Whatever your action step might be, the key is to make it exciting. Think about the blogs you visit on a regular basis — what inspires you to reach out and leave a comment or email someone? It’s got to be a topic you care about, a strong opinion you share or something that you’re just really, genuinely passionate about. Know that not everyone will follow through with your action step, but if you can get 10% of your audience to communicate with you, you’re well on your way to building a fantastic fanbase. A great, well written post means nothing if it goes unread. Come a little closer to the screen friends, I need to share something important. You get one — ONE — post where you just outright share a link to your blog with the headline. One. After you’ve used that, you have to get creative. Pose a question that relates to your blog topic or quote a great line. Just don’t be a hammer spammer and bang people over the head with your blog post, okay? Good, glad we were able to get through that together. –sharing your post on the web. You should also share your weekly posts in your newsletter and make sure you have an RSS feed set-up so your readers can subscribe to your blog updates with their eReader of choice. If you want to learn more about being a great blogger, check out some great advice from our friends at Copyblogger, The Book Designer and 30 Day Books. Do you feel like a better blogger? We all have it in us to be great bloggers. In fact, I’m not sure anyone on the web is better equipped for blogging than us indie authors. We are writers first and marketers second, which makes us perfectly suited for blogging success. You just needed a little direction (not unlike your blog) to get you started. So tell me right now how you’re going to start being a better blogger today, this very minute! This is great advice. I’m in just this situation; my audience is growing slowly–though at least it’s growing–and I’m still trying to find my “voice.” I especially like your suggestion of focusing on four specific categories…that’ll help, well, focus what I want to say. Thanks for this! I also like the idea of the four categories and making sure you post about each one each month. Great information in this post. Awesome! It will definitely help you come up with a schedule and stick to it Thanks Michelle! Oh, good, I’m already doing most of these. Not the scheduling; I worry about feeling restricted by topic if I schedule a category in advance. But my blog has several fun categories, so I’m circulating naturally for the moment. Thanks for the post! and especially the reminder about not spamming. Hey Laura! I know most of our readers are definitely not spammers, but it is really tempting sometimes to throw out that basic link a couple of times to make sure everyone sees it. But being creative with blog post promotions yields better results! Glad you enjoyed the post and that you’re already utilizing most of them. Thanks–these are great suggestions. I think the idea about sharing more of yourself in your blog is frightening, but smart! I’m posting your blog for our creative writers group. We need all the help we can get! Do you have a post somewhere that goes into greater detail about how to find out what your audience is looking for in a blog (i.e. goes into greater detail about step #1 above)? I felt like that entire prediction with the crystal balls was my life story (or at least my blog story) how do you do that? These are all suggestions I’ve heard before (mostly) so I have to assume that they are, in fact, true and the internet isn’t trying to screw me over. I just sometimes feel like I’m going through all this work and no one is even paying attention – and then I remember that my blog is still pretty new and I am, in fact competing with a fillion other bloggers – so it’s a matter of perserverance I suppose. Thanks for posting this! Just followed this from the Duolit Twitter feed, and it clarifies a lot of stuff others just talk about (like editorial calendars and the balance between Blog Focus and Bringing As Much Of Yourself As You Can). Thanks for this, ladies!